The squashes are loosely divided into 2 basic categories—winter squash and summer squash. Their toughened skin makes the winter squashes easier to store and use over a longer period of time without rotting or drying out. 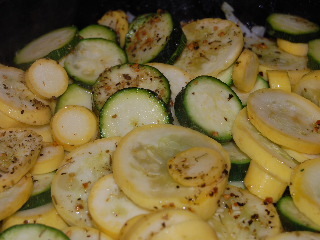 The summer squashes (and this includes zucchini) are harvested and used while their skins are still soft. They tend to be prolific producers and, once the plants start to bear usable squash, they can be harvested and used straight from the garden on a regular basis—much like tomatoes. Long recognized for its nutritional value, squash has been cultivated for thousands of years. It is one of the “Three Sisters” raised by the Native Americans—the other two being corn and beans, the cultivation of which was taught to the early white settlers. 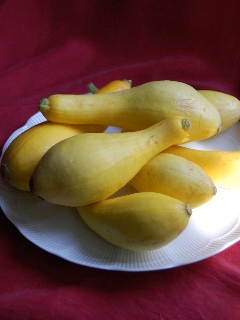 Summer squash is easy to grow in your home garden. Loose, well-drained, organic soil (add compost, rotted manure, or peat if needed) is required, as is a location that receives plenty of sunlight. Young plants of summer squash will not transplant well. So, rather than starting plants indoors and then transplanting to the outdoor garden, it is necessary to sow the squash seeds directly into your garden. Just be sure all danger of frost has past, and plant your seeds (about 1 inch deep) far enough apart that the plants won’t be crowded as they mature and start to produce usable squash. As the young plants get up out of the ground, a mulch of clean straw, grass clippings, or hay will help conserve moisture in the soil and aid in the prevention of weeds. If all goes well, you should be harvesting squash and heading for the kitchen with the bounty in just 6 or 7 weeks. Cut them from the plant, rather than pulling them so you won’t tear the tender skin of the squash. Wash the squash and cut any blemishes from the surface—no need to peel off the tender skin. Squash is a good source of fiber, protein, thiamin, riboflavin, and Vitamins A, C, and K.
Buy seeds from your local garden center early in the year or order from a reliable supplier such as the Burpee® Seed Company.